Home Journal of Ayurveda Medical Sciences, Vol 3, Issue 1, Jan-Mar, 2018 Pharmacognostical and Phytochemical Characterisation of Cork and Seed of Tamarindus indica Linn. Naik, Padigar, Bairy, Prabhu, and Narayana: Pharmacognostical and Phytochemical Characterisation of Cork and Seed of Tamarindus indica Linn. Department of Pharmacognosy, Siddha Central Research Institute (CCRS), Anna Hospital Campus, Arumbakkam, Chennai 600106, India. Correspondence to: CITE THIS RESEARCH AS Naik TI, Padigar S, Tantrady SB, Prabhu S, Sunil Kumar KN. Pharmacognostical and Phytochemical Characterisation of Cork and Seed of Tamarindus indica Linn. J Ayu Med Sci 2018;3(1):311-17. Chincha (Tamarindus indica Linn.) is a tropical tree which is extensively used in Ayurveda and folk practice across South Canara for various ailments such as indigestion, as cardiac tonic, vermifuge, burning sensation, diarrhoea and diabetes. The cork and seed of T. indica has been successfully used by the folklore practitioners of Udupi District in the treatment of various types of wounds. As systematic authentication of herbal raw drug is becoming increasingly important to produce standardized herbal products this study was planned. Macroscopic features and powder microscopy of cork and seed of T. indica are documented along with their photographs. Phytochemical test was carried out in order to figure out the constituents present in the seed and cork. HPTLC finger print profile of ethanol extract of T. indica cork and seed was also been carried out. 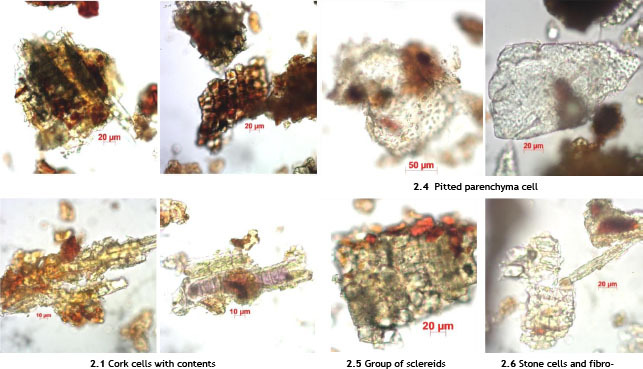 Powder microscopy showed the presence of calcium oxalate crystals, group of sclerieds, Crystal fibres in cork and fragments of cotyledone with fixed oil, Parenchymal cells in seeds. Phytochemical screening showed the presence of coumarins, flavanoids, saponins, tannin, alkaloid, steroid and carbohydrate. These diagnostic features can be utilized as a fingerprint for the identification and differentiation of their substitute and adulterants of the plant. Numerous drugs have entered the international pharmacopeia via the study of ethnopharmacology and traditional medicine. Ayurveda is one such great living traditional system which has an important role in bioprospecting of new medicines and also giving encouragement to ethno pharmacological research. Several recent surveys have shown that using ethno pharmacology as a basis of selecting species for screening results in a significant increase in the hit rate for the discovery of novel active compounds compared with random collection of samples. As Ayurveda mentions that the plants available in vicinity are much beneficial in the management of diseases. The usage of drugs which are commonly available, cost-effective and efficient should be encouraged rather going for the expensive drugs. This will also reduce the burden over the routinely prescribed classical drugs thus preventing them from the verge of extinction and can be progressively used for longer time. T. indica Linn of Caesalpiniaceae subfamily is commonly identified and known as Chincha in Ayurveda system of medicine. Its fruit, tender leaves and flowers are used extensively in culinary and medicinal preparations. It’s a large wide spreading tree 12 to 18 m high. The trunk with dark rough bark has deep cracks; leaves 5 to 12.5 long, leaflets sub sessile, 10 to 20 pairs; flowers in lax few flowered racemes, petals 3, yellowish with pink stripes; pods pendulous, 7.5 to 20 cm long, slightly curved, sub compressed; seeds smooth, reddish brown, enveloped by tough leathery membrane. It has scientifically reported for several medicinal properties viz. anti-oxidant, anti-inflammatory, analgesic activity and anti-arthritic activity of seed, anti-oxidant activity, antibacterial activity, anti-microbial activity of fruit, antibacterial, hepatoprotective effect of flowers, anti-microbial activity of leaves, hyperglycaemic activity, anti-microbial activity of bark. The cork and seed of T. indica has been successfully used by the folklore practitioners of Udupi district in the treatment of various types of chronic wounds. 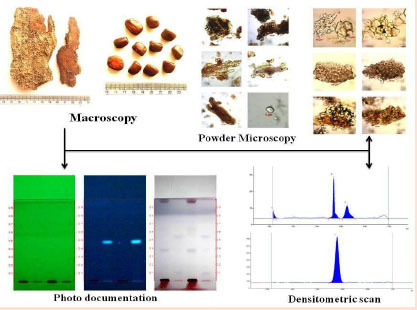 Considering the traditional claim and reported activities pharmacognostical study, analytical study and HPTLC finger printing of cork and seed of T. indica was undertaken by making use of various parameters to standardize & authenticate in accordance to international standards and quality control of Ayurvedic drug. The tree T. indica was authenticated botanically by referring flora of Udupi. Fresh seed and cork is collected from the well mature tree from Udupi district of Karnataka, India. The sample is deposited at SDM centre for Research in Ayurveda and Allied Sciences, Udupi (Voucher specimen number 647/15072701-02). The Cork and Seed of T. indica dried in shade powdered and sift through sieve number 40; the powder was stored in glass vials until microscopic evaluation. The external features of the test samples were documented using Canon IXUS digital camera. Macroscopic characters like size, shape, texture and colour were noted in detail. The macroscopic features were compared to local flora for authentication. A pinch of powder was warmed with drops of chloral hydrate on a microscopic slide and mounted in glycerine. Slides observed under microscope and diagnostic characters were observed and photographed using Zeiss AXIO trinocular microscope attached with Zeiss AxioCam camera under bright field light. Magnifications of the figures are indicated by the scale-bars. Tests to find the presence of alkaloid, steroid, carbohydrate, tannin, flavonoids, saponins, terpenoids, coumarins, phenol, carboxylic acid, amino acids, resins and quinine were done as per standard methodology. One gram of powdered samples were dissolved in 10 ml ethanol and kept for cold percolation for 24h and filtered. 8 and 12μl of the above samples of were applied on a pre-coated silica gel F254 on aluminum plates to a band width of 7 mm using Linomat 5 TLC applicator. The plate was developed in toluene: ethyl acetate (9.0: 1.0). The developed plates were visualized in UV 254, 366nm and then derivatised with vanillin sulphuric acid reagent and scanned under UV 254, 366 nm following derivatisation. Rf, colour of the spots and densitometric scan were recorded. Cork occurs as pieces of size of about 5 to 10 cm long and 3 to 5 cm wide, having dark brown colour, light in weight, up to 5mm thickness, odour not characteristic and taste astringent, fracture short, fracture surface is splintery, Outer surface rough with tubercles, inner surface smoother than upper (Figure 1.1). The seed is flattened, more or less rounded, sub-rectangular, oval to oblong with raised margin encircling the central flattened portion (oriole) or large patch, which is more reddish brown to brown in colour, strongly lustrous and exhibit pale yellowish lines running parallel to each and occasionally getting connected in the central region. Size 1 to 1.5 cm in length 0.5 to 0.8 cm in width and 0.2 to 0.3 cm in thickness, the edged marginal portion encircling the seed is broad, dull brown, minutely pitted and exhibit centrally located narrow longitudinal groove running throughout the margin, a pale yellowish elevated spot lying in the narrow groove at the basal region of the seed is the hilum, micropyle being located at its opposite end, testa is thick and brittle and easily detachable by roasting or by boiling the seeds in water exposing the inner whitish bulky cotyledon; taste is slightly astringent, having specific characteristic odour(Figure1.2 and 1.3). Brownish coloured coarse powder with astringent taste and without any characteristic odour. The cork powder exhibits the following inclusions when examined under the microscope. Crystal fibres and Calcium oxalate crystals observed. Pitted parenchyma cells were observed in the powder, the parenchyma cells are wide, short, vertically oblong cells, often found in bundles. Crystal strands are very common. They are scattered individually or in continuous vertical strand. Group of sclereids, stone cells and fibro sclereid are also observed (Figure 2). Pinkish pale brown coloured coarse powder with astringent taste and with characteristic odour. The diagnostic characters of the powder are fragments of exotesta (palisade cells) in surface view showing circular thick walled cells with brown pigment; transversely cut fragments of exotesta showing palisade cells with bulbous swellings and warty line crossing across, thick, irregular, sinuous walled cells of hypodermis of exotesta with brown colour; isolated or groups of irregular cells of mesotesta with brown pigment; isolated or groups of cells of various sizes and shapes from endotesta; groups of thin walled fibrous cells, non-pitted sclereids from the hilum; fragments of mesophyll cells with characteristically bulbous thickened wall, embedded with protein and groups of annular vessels; fragments of plumule and fragments of cotyledone with fixed oil, Parenchymal cells scattered as such throughout; fragment of lower epidermis of cotyledon in surface view embedded with aleurone grains (Figure 3). Phytochemicals are primary and secondary compounds which are naturally occurring in the plants. The preliminary phytochemical studies are essential to know the basic constituents present in the drug. Alcoholic extract of T. indica cork and seed were subjected to preliminary phytochemical study, according to standard protocol. The tests were conducted to detect the presence of alkaloids, steroids Carbohydrate, tannins, flavonoids, saponins, terpenoids, coumarins, phenol, carboxylic acid, amino acids, resins and quinones (Table 1). HPTLC finger print profile of ethanolic extract of cork and seed of T. indica were recorded. TLC photo documentation revealed no spots under 254 nm, under UV 366 nm there was no spots in seed extract of T. indica and 1 spot was evident with Rf 0.48 (F aqua. 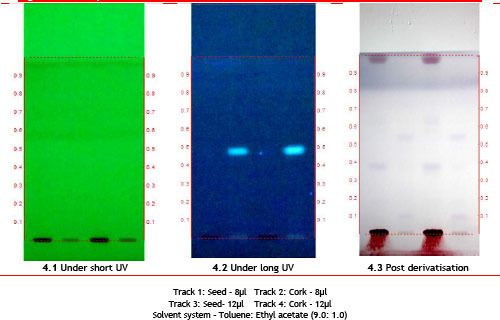 blue) was observed in cork extract of T. indica, under 620 nm post derivatisation with Vanillin sulphuric acid spraying reagent there were 3 spots in Seed extract and 4 spots in cork extract respectively (Table 2 and Figure 4). Densitometric scan at 254 nm, T. indica seed revealed 3 peaks corresponding to 3 different constituents in the ethanol extract, with Rf0.02(79.01%), 0.66 (14.10%) and 0.78 (6.89%) were the major peaks. 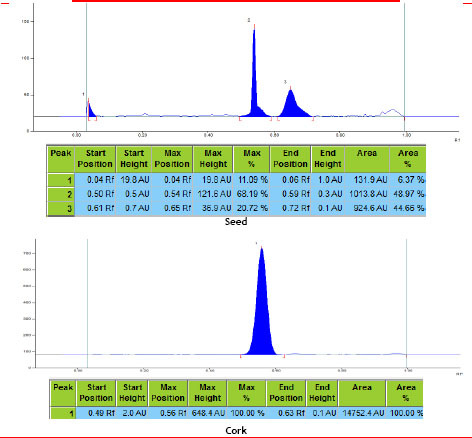 T. indica cork revealed 3 peaks corresponding to 3 different constituents in the ethanol extract, with corresponding Rf of 0.02(82.26%), 0.67 (10.93%) and 0.79 (6.81%) were the major peaks (Figure 5). 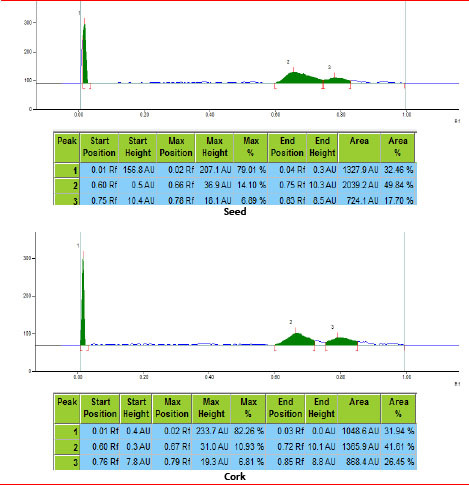 Densitometric scan at 366 nm, T. indica seed revealed 3 peaks corresponding to 3 different constituents in the ethanol extract, with Rf0.04(11.09%), 0.54 (68.19%) and 0.65 (20.72%) were the major peaks. T. indica cork revealed one peak corresponding to one constituent in the ethanol extract, with Rf0.56 (100.00%) was the only major peak (Figure 6). Macroscopy of Tamarindus indica Linn. The macroscopic features recorded in this study can be used for the preliminary identification of the part of the plant. 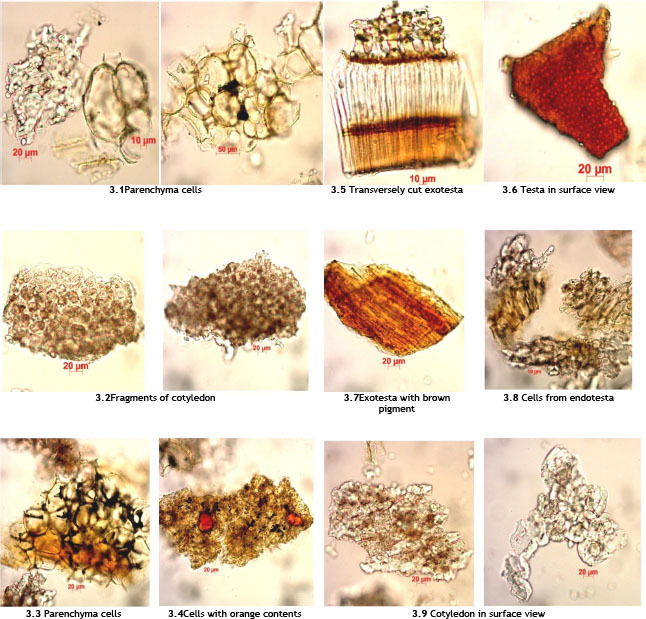 Presence of calcium oxalate crystals, group of sclereeds are marked features of powder microscopy. The preliminary phytochemical study indicates the presence of coumarins in cork extract and tannin, flavanoids, saponins, terpenoid, and coumarins in seed extract which is in support of wound healing activity. HPTLC photo documentation revealed presence of phyto-constituents with different Rf value. Further Scientific evaluation at molecular level, marker compounds and pharmacological confirmation required. Authors are grateful to revered president DR. D. Veerendra Heggade and Dr. B. Yashovarma, Secretary SDM Educational society for constant support. Authors express their sincere gratitude to Dr. B Ravishankar, Director, SDM Centre of research in Ayurveda and Allied sciences, Udupi, for constant encouragement and facilities providing during research work. Dr Thejaswi and Mrs Suchithra performed all experimental work in phytochemical parameter, HPTLC and any other laboratory work. Dr KN Sunil Kumar, Dr Shrikanth P and Dr T Shridhara Bairy contributed to planning and execution of research work, literature survey for article, drafting and finalization of article as per the format. Bhat KG , author. Flora of UdupiUdupi: Manipal Press Limited. 2003;125–178. 188.